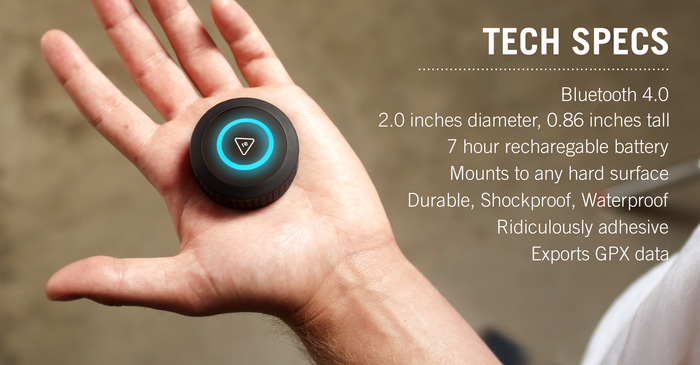 New Kickstarter project Trace is like a Fitbit for your extreme sports needs, allowing people who skate, surf, snowboard and ski to track a lot more than just time, distance and pace while participating in the sport they love. The Trace is the latest from ActiveReplay, a company that created AlpineReplay, an app and network for skiers to track and share their stats on the mountain. Both AlpineReplay and the Trace are the brainchildren of Dr. Anatole Loshkin, one of the founders of GPS company Magellan, and his team of seven engineers based out of Hunting Beach, CA. 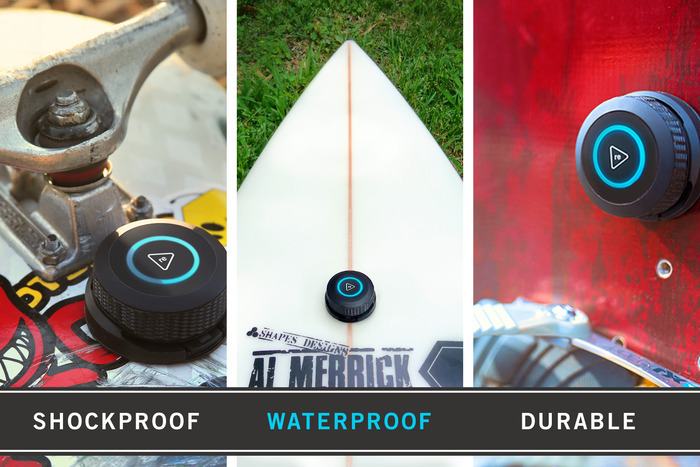 The waterproof and shockproof Trace is a small cylinder, roughly the size of a Reese’s Peanut Butter Cup, which can affix to your board using a separate mount (and it’s detachable so that you can use it on multiple boards in multiple sports). 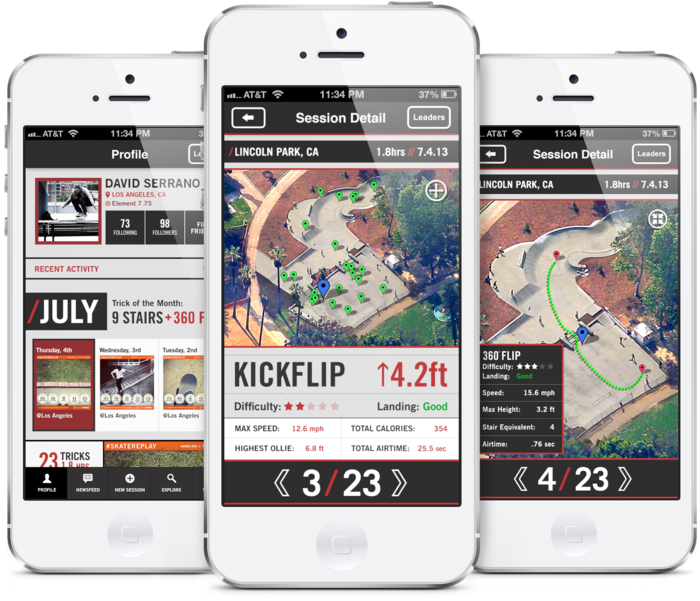 It’s designed to gather data including speed, distance, jump height and rotation, and has specialized free apps on iOS and Android for surf, skate and snow sports. The apps not only collect your data and give you a history you can check at any time, but add in a social element, allowing you to share that info with other athletes in your field. Through repeated use, ActiveReplay says they’ll be identify more and more tricks, letting them know exactly when a user lands a kickflip, for instance, or a 360, etc. I spoke to ActiveReplay VP of Products David Loshkin, who himself has a background in applied mathematics from Harvard and has been writing a lot of the code for ActiveReplay, and whose personal interest in and passion for surfing, skating and snowboarding drove a lot of the product direction for ActiveReplay. The Trace is definitely cool, but is it something that can scale? Action sports are already more limited in appeal than general fitness activities like biking and run, after all, and only a small portion of people who participate in those sports track their activity with a dedicated device. But Loshkin argues that there’s a very big market for Trace, and notes that huge brands like Red Bull and ABC invest a lot in action sports, and they make up a good chunk of marquee broadcast events like the Winter Olympics. The ActiveReplay Trace campaign is seeking $150,000 to get the device to mass production-ready state, with funding set to close in September and a ship date of January for the first batch of devices. The Trace starts at $99 for an early-bird pledge, and the company is being smart and staging batches so that they only have to manage fairly small volume shipments with each. Dr. Anatole Loshkin has lots of experience shipping hardware at Magellan, and clearly knows that promising too much too quickly is a pitfall to be avoided with hardware startups. As a former (very) amateur skateboarder, I’m very interested in the kind of data the Trace can gather and report. Action sports may have a smaller user base than more broad activities like running, but it’s not as small as you might think, and it’s also a much more dedicated and invested group, so something like this makes a lot of logical sense for that market.